This guide isn’t aimed at telling you what the best paint brush is, but to inform you on making decisions regarding miniature paint brushes. The paint brushes you use are very important. The wrong brush can turn an easy technique into something that feels impossible. I’ve been painting miniatures since 2006 and I’ve learned a lot in those years. That experience is what I want to share with you today to help you make good choices for miniature paint brushes. I do also have other tips and advice, including proper brush care. Ideally this article covers any miniature paint brush questions you have. This is a bit long, so here’s a little index to bounce around if you’d like. The basic components to a brush are: bristles, ferrule, crimp, and handle. 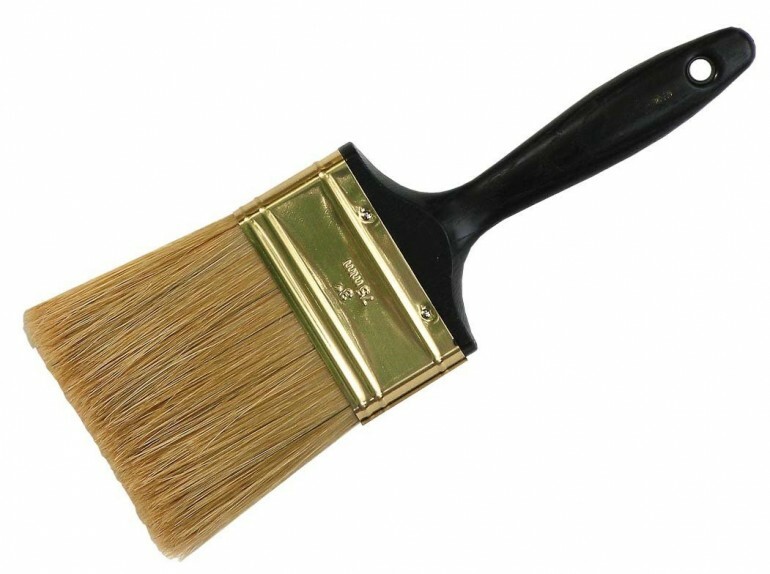 Bristles – Holds the paint and it’s the part you paint with. Ferrule – The silver part that holds the bristles together. Crimp – The area securing the ferrule to the handle. There’s quite a few brush types for traditional art, but I’ll only go over those that are used in miniature painting. Well, at least those that I use. Pointed round is the type you’ll most often want. These brushes tend to have a wider belly for holding paint and a pointed tip for details. So, they’re great for layering and all levels of detail work. 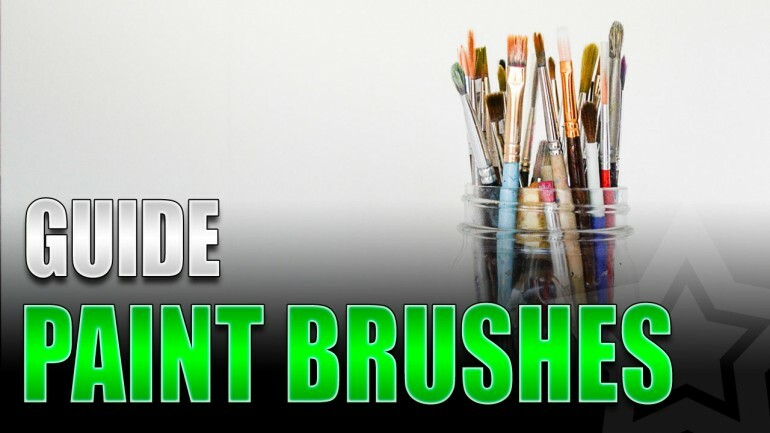 This is the brush you’ll want to use for most of your work on miniatures. However, I’ve found it hard to find these in stores and have had to buy mine online. Raphael 8404 pointed round brushes size 2, 1, and 0. Round brushes are great brushes for base coating models, layering, and bigger detail work. Their similar to the pointed round but with less of a refined tip. They’ll hold a lot of paint and give you enough control to keep it where you want it. A super cheap size 5 brush and a Princeton Art round brush, size 2. The last type you’ll likely see is the flat brush. You’ll mostly be using this type for dry brushing because it has a great surface area and holds quite a bit of paint. It’s too big for much of anything else with regards to miniatures. Two cheap size 2 flat brushes that I use for dry brushing. Synthetic bristles are popular among cheaper brushes. They’re supposed to replicate the feel of natural bristles while being easier to maintain. I don’t care for them. I find synthetic brushes to be too stiff compared to natural bristles. They’re also a bit more difficult to clean on my experience. Natural bristles are very soft and flexible, which is ideal for painting miniatures. You’ll be able to get a finer point on your brush for details and it cleans up easier too. The natural brushes are more expensive than synthetic but worth it. Speaking of natural, there’s the almighty Kolinsky Sable brush. 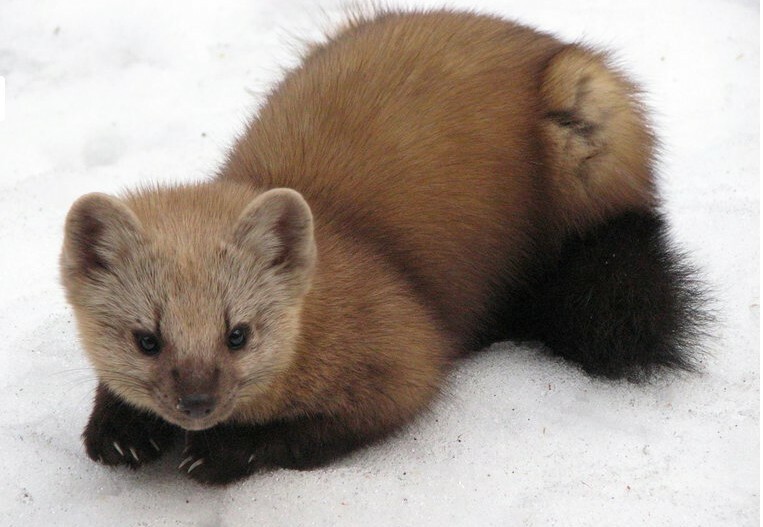 Kolinsky Sable brushes use hair from a Siberian weasel. It’s recommended in traditional painting for oil and watercolor paints. This cute little weasel makes some amazing paint brushes. This makes a great brush in miniature painting because of it’s bristle strength, flexibility, and ability to hold a fine point. The Kolinsky Sable brushes are some of the most expensive brushes you’ll find in miniature painting and are highly regarded. Traditional paint brushes come in numeric sizes, like size 2, size 1, size 0, etc. Some companies, like Citadel (Games Workshop), don’t list their brushes by traditional sizes but by general size and type of brush, like Medium Layer Brush. While the Citadel style of labeling a miniature paint brush is convenient, it’s only common to them. So, you’ll need to know about normal sizing for buying brushes otherwise. Also, the sizes listed are for pointed round brushes or round brushes, what I recommend for a shape for miniature painting. If you have a good brush, then you’ll find a size 2 is a good all-around brush size. You can use this size for layering and detail work, at least if you have a pointed round. I wouldn’t recommend anything larger than a size 2 for miniatures unless you’re painting a lot of larger vehicles or something. From there it only gets smaller. A size 1 is a good mid-range brush that’s good for fine highlighting, edge highlighting, and also detail work. The size 0 is the smallest brush I use and recommend. You would use a size 0 for things like eyes, pupils, teeth, and other very fine detail work. Now, you can go even smaller by getting size 00, size 000, etc. Some painters do like having brushes that small. Having some isn’t a bad idea, but they are very situational and not top priority sizes to have. Getting yourself a size 2, size 1, and size 0 should cover everything you need for typical miniature painting. Make sure you’re using an appropriately sized miniature paint brushes for the task at hand. You don’t want to base coat a model with a size 0 brush. You will be at it for hours if you try. Also, don’t use a size 4 brush to paint eyes. Fine point or not, a size 4 is just too big to work on that small of a scale. This is not a fine detail brush. I personally recommend learning with a size 2 brush. A good size 2 brush can do most everything with some practice. If you get good with a size 2 then you’ll paint quicker as you won’t need to constantly rotate brushes for different jobs. Plus, you’ll get really good at brush control. Even still, you’ll need to bust out a size 1 or size 0 from time to time. The point is to use what you need instead of trying to make a brush do something it wasn’t intended for. That’s a lesson I learned the hard way, often to the detriment of my brushes. Taking care of your brush is crucial. Nobody wants to spend money on something that only get destroyed in a few uses, right? So, here’s a few tips to keep your brushes in good care for a long time. The metal area that the bristles go into is called the ferrule and it holds all the bristles together. If you get paint into this area then that paint will dry and cause your bristles to split, so your brush will no longer hold a point. I try to not get paint on more than 3/4 of the bristles. If you load more paint than that then you’ll risk getting it into the ferrule and ruining the brush. Like anything that gets used often, your miniature brushes should be cleaned routinely. The easiest way to do this is by using a brush soap. I use Masters Brush Cleaner, which you can find online or at most local art and craft stores. The soap is very easy to use and I recommend using it at the end of each painting session. It’s great to clean the residue on the brushes and also serves to condition the brushes as well. I put together a simple video to show you how to use this as well. There are some tasks in miniature painting that you don’t want to use your good brushes for. The one I’m talking about are when you need to get paint from a pot or you need to mix paint. Reaching a brush into a paint pot is a good way to accidentally get paint in the ferrule of your brush, and as noted above – that’s how you ruin a brush. The same of true of mixing paints, whether it’s mixing two colors or you’re creating a glaze. This is another way you can accidentally get paint in the ferrule and destroy your brush. So, just make sure you have some scrap brushes lying around to perform tasks like this. There’s quite a few ways to store your brushes safely. Many of us have a container we put our brushes in, like a coffee mug. As long as you’re storing your brushes like this with the bristles up then you’re good. I also will often leave our my good brushes on my painting table. I leave them laying on a paper towel. This saves me from having to search through my 100 brushes to find my good ones. Again, there’s lot of good ways to store your brush, and leaving it in your paint water bristles down is not one of them. I’ve seen this so many times and it hurts to see. If you leave a brush in paint water with the bristles down then you’re going to ruin the brush. Trust me. Don’t do this. 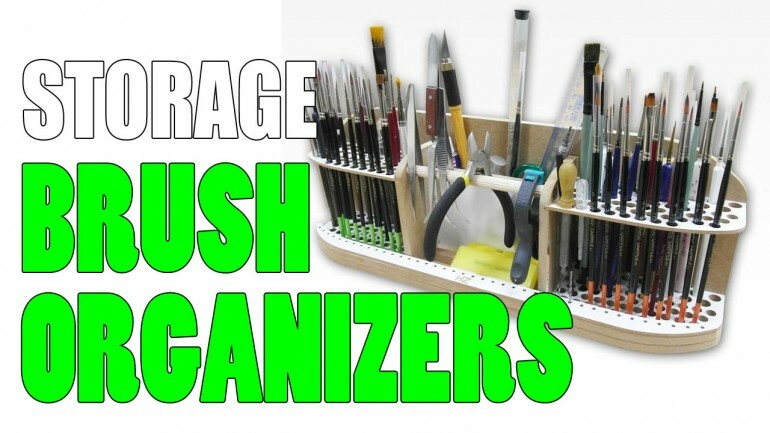 I do have an article on my other blog with some suggested paint brush storage options if you’re after an organizer. As you’ve no doubt noticed, paint water gets murky, and sometimes even stinky, pretty quick. The water your wash your brushes in should be clean, otherwise you’re just letting gross water dry on your brush, which will ruin it over time. I like to change my paint water every few sessions. I also have 3 separate water pots. I have one for normal paints, one for metallic paints, and one to clean my brush in when I’m all done. Separating the normal paint and metallic paints is something I recommend to anyone. Metallic paints have flecks of metal in them. If you’re trying to paint a normal, solid color and those metallic flecks get in there, then you’ll have a shimmering color – not ideal. Washing those colors separately will help prevent that type of situation. The separate pot for final cleaning is the same sort of idea. Washing your brush in water full of paint isn’t going to clean it, even if you’re using brush soap. So, having a separate water pot for final cleanings will make the cleaning process much more effective. This is probably the most obvious but it bears saying. Do not let paint dry on your brush. If paint does dry on your brush then use a brush soap to clean it off. When I’m painting I will always keep my brush wet for this reason. If I’m working on something and it’s taking a while to accomplish, like base coating large areas of a model, then I’ll routinely clean off my brush, load it up again, and keep going. I try to not work with a color on my brush for more than a minute if I can help it. Acrylic paints dry very fast, especially as little as we use in miniature painting, so be aware of that and keep cleaning your brushes to keep them wet. I’ll break down the miniature paint brushes into quality/cost, so you can jump to the section that suits you. I do also want to say that brush quality matters. It very much matters no matter if someone tells you otherwise. Some painters feel that buying a pack of brushes for a few dollars is the smart play because you have to replace brushes eventually anyway. While you do have to replace brushes eventually, a high quality brush you spent a little money on will be the best economical choice you make. Some painters will get 2 years or more out of their Winsor & Newton brushes, a more expensive brush. A cheap brush is more affordable, but you’ll find you need to replace them every few weeks or you’ll struggle through painting with a ruined brush. So, the high-end brushes cost more up front but save you money in the long run. Plus, those brushes are simply amazing to use compared to the cheap brushes. Trust me. I wish I realized that sooner than I did. When you’re learning to paint you can start with a cheap set of brushes. That being said, I do not recommend picking up those brushes that come in a package of like 5 for a few dollars. Those are absolute trash. Trying to learn to paint with those will only frustrate you. Instead, at most craft stores you can find brushes that are sold individually. The brushes I most often picked up in my earlier years were Lowell Cornell and Princeton Art. Now, both of those companies do have some expensive brushes too, but I’m talking the cheapest ones they offer. They’re affordable, so easy to replace when you damage them, but hold up pretty well for the price. Best yet, they won’t aggravate you as you’re learning to paint like those packaged garbage brushes will. I still have some of these brushes I keep on hand. A step up from there, for brushes I’ve actually used, would be the Citadel line of brushes. I’ve had some mixed luck with them. Some of those brushes have held up great where others were ruined way too quickly. Also, the previously mentioned Lowell Cornell and Princeton Arts have some decent mid-range brushes as well. From Citadel I’ve used the Small Layer Brush and the Medium Layer Brush. The small one has held up really well, and I still use it today, where the medium is a bit hit or miss. Also, the prices on these are very reasonable. I also have, and still use, a Medium Base Coat Brush and a Medium Shade Brush. There’s nothing special about the base coat brush, but the shade brush is pretty fantastic. It holds a lot of wash and/or glaze, and it holds together well when loaded and being used. I do not suggest getting any of the Artificer Brushes from Citadel. You can buy better brushes for less money. I have heard good things about the Army Painter line of brushes. I have not used them, but I believe they are pretty equivalent to the Citadel line, if not better. I’ll break this down into manufacturer as there’s a bit to say about each. I am currently using the Raphael 8404 brushes and I love them. They’re the first Kolinsky Sable brushes I’ve owned and I wish I had bought them sooner. The brush I use the most is the Size 2. That’s my workhorse brush that I do 90% of my painting with. It holds a lot of paint, so great for layering, and it holds a fine point, so also great for details. I do also own a Size 1, which is the brush I use the least. Absolutely nothing wrong with the brush, it’s just I prefer using the Size 2 for almost everything. Lastly, I have a Size 0 brush as well for those very fine details, and it does those fine details great. This is the size I use for eyes and any super fine lines that need painting. If you want to get some quality brushes then I would suggest these. You can get away with the Raphael 8404, Size 2 for a lot of stuff if you want to try them out. The Size 0 is also a good buy, and between those two brushes you can do everything. The brushes I have not tried, but we’ve all heard about, are the Winsor & Newton Series 7. These brushes have forever been synomous with miniature paint brushes. Going this route is not a bad way to go. They are a bit pricier than the Raphael 8404 brushes, but not substantially. Like I said, miniature painters have been using these brushes since they came out. They’re tried, true, and tested brushes in the industry. Now, I will warn you and say that I’ve seen painters complaining lately that the quality control of the Winsor & Newton brushes is lacking. This is from painters I know who have used those brushes for years and years. A quick note on those links for the Raphael and Winsor & Newton brushes. I normally link things to Amazon, however, for these brushes I have seen people complaining about the quality of the brushes from the sellers. So, I’m linking to Blick for those to cut out the middle-person. It’s where I bought mine and I have no complaints. Artis Opus is an up and coming line of brushes aimed at miniature painters. The big thing with Artis Opus is that you’re buying a set of brushes with every size you need. They are Kolinsky Sable brushes, so the quality is there. I do know a few miniature painters who have tried these brushes out and really enjoyed them. These are great painters I trust, so going with Artis Opus is a good choice if you’re in the market for higher end brushes. Oh, you can buy individual brushes from them as well and the price is comparable to Raphael 8404 and Winsor & Newton Series 7. These are a bit pricier than the Winsor & Newton Series 7, so buying the set seems the best deal since you get a discount. They do have a video if you’d like a bit more info too. This is another line of brushes I haven’t used. However, someone I know does and he really likes them. 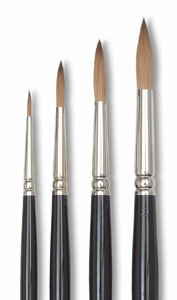 You can find some Kolinsky Sable brushes from size 8 down from Scharff. The best prices I’ve found for these are straight from Scharff themselves or Secret Weapon Miniatures. These are pricey though and are the most expensive on the list here. Again, I can’t speak to these brushes personally, but my friend is a great painter and I trust his judgement, so these would seem like another great buy for brushes. Whether you’re a beginner or a veteran, having a good brush really makes a difference. I can’t recommend getting some Kolinsky Sable brushes enough when you can afford them. They won’t make you a better painter but they will make painting easier. On a related note, on my other blog I have an article covering various paint brush holders/organizers if you’re looking for good ways to store yours. What miniature paint brushes do you recommend? Let me know in the comments. I’ve been using the Artis Opus Series S for a few months now. They’re great brushes. But the other thing I had not considered is that when you spend that much on brushes, you up your game by accident. I mean, wouldn’t you drive better and more safely in a Ferrari? Than your regular run around car? You’re absolutely right. I use the old brushes to jam into those tight spots. The new nice ones are for quality work only and get taken care of very well after each use. I think those are great advices, to follow! The only thing I can say is that the size is not always the unique variable to look at when you do details: for example, a good 2 with a sharp tip, is great to do many small details -or doing them with calm-, because its “bristle belly” keep a good amount of colour, so it does not dry meanwhile you’re doing a good amount of small details. Sometimes a 0 or 00 is compulsory, but a trashy one could be worst than a top tier 2. In the other hand I paint generally with thrashy brushes, I got a pair of W&N, but I prefere have the freedom of using my brushes with the worst things without the fear of ruin them. Also, my work could be too much precise with those frills like sharp tips LOL! Yeah, I use a 2 with a good tip for almost everything. Haha! With Nurgle you don’t need a lot of precision, so crappy brushes make sense. Nice to have some good brushes when you need them though. Also for Stormcasts, marines, skeletons and so on, crappy is a way of live the hobby, ha! We all have our own style of painting and all we can do is embrace it. A note on buying stuff from Amazon where the quality really matters: Amazon stores all their stock with a given SKU together, regardless of where they come from. It’s particularly an issue with “fulfilled by Amazon” items, since the stock of those potentially comes from a ton of different places, and there’s no record of which source any given item came from, or what it’s original source was. What this means is that if one supplier slips some counterfeit or otherwise poor quality items in with whatever they’re consigning on Amazon, they can end up going out with any order of that item, regardless of who the nominal seller actually is. It’s been a growing problem in a number of areas for quite some time, and it just occured to me when you mentioned linking to Blick instead of Amazon for the high end brushes that it may well be behind a lot of the hit or miss results people have been getting from those. On brushes, specifically, in some circumstances (particularly long straight edges), I find it easier to get even edge highlighting with a flat brush than a round one. It’s one of the few places I use them other than drybrushing and base coating. I had no idea how anything at Amazon worked, so that’s very insightful; thank you. It makes perfect sense too, how that happens. I’ve never tried a flat brush for an edge highlight. I’ve always had good luck with round or pointed around there. Fair enough. Do you have any recommendations for high-quality synthetic brushes? I have to claim ignorance on that front. Those are amazingly cheap (price) compared to what I’m using. I’ll definitely check those out and add them into the article as well for those who prefer humanely sourced brushes. Also, I didn’t take offense. I get it. The advantage of getting older (for some of us anyway), is realizing we all have different experiences and views. I don’t get offended easily because I realize there’s a lot I don’t know. I’d rather take the moment to learn what I don’t know than argue about what I think I do.